LQ are fourth on the table with two points by winning one and losing two and IU are last on the table with two points as well but have less net run rate than Lahore. Both the teams haven’t started this tournament with the way they would have wanted but there is a lot matches left and they can still play well and go up the table. 10th February, 2016 at 21:30 (IST). Sharjah Cricket Association Stadium, Sharjah, United Arab Emirates. Both the teams won their previous matches in the league and opened their account in the league with their first wins. Islamabad United played against Karachi Kings in their previous match in the league where Karachi Kings won the toss and opted to bowl. Shane Watson and Sharjeel Khan opened the innings for Islamabad and made 13 and 28 respectively. After that Khalid Latif made 39 off 35 balls with one four and two sixes after Bopara bowled him out. Zaidi made 2, Russell made 2, Bisbah made 4, Bilings made 4 and Khalid made 12 and Mohammad Sami made 20 off 9 balls with two fours and one six and Islamabad made 132-8 in 20 overs. Karachi Kings was able to make 130-9 in the 20 overs and lost the game by two runs. Wasim made 29, Shakib Al Hasan made 20 off 22, Ahmed made 19 and Bopara made 32. 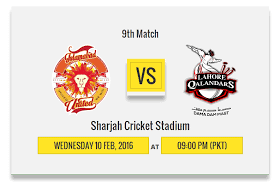 Lahore Qalandars played against Quetta Gladiators in which Quetta won the toss and opted to bowl. Azhar Ali and Cameron Deport opened the innings, Azhar Ali made 20 off 21 balls and Cameron Deport made 73 off 55 balls with eight fours and three sixes. After that Umar Akmal made 93 off balls with six fours and eight sixes and the team was able to make 194-3 in 20 overs with 3 extras. Quetta Gladiators made 131-10 in 16.2 overs and lost the match. Only two players made their impact as Mohammad Nawaz made 42 off 34 balls with five fours and one six and Sarfraz Ahmed made 31 off 19 balls with three sixes and one four. Mohammad Sami, Shane Watson, Misbah-ul-Haq, Khalid Latif, Saeed Ajmal, Andre Russell, Sam Billings, Sharjeel Khan, Imran Khalid, Ashar Zaidi, Rumman Raees. Azhar Ali (c), Cameron Delport, Mohammad Rizwan (wk), Naved Yasin, Dwayne Bravo, Umar Akmal, Hammad Azam, Zohaib Khan, Kevon Cooper, Ajantha Mendis, Zafar Gohar. Both the teams are in good form as they won their last match and now they should continue on the winning ways. Do come back here for the IU vs LQ match result, the man of the match, highlights full, complete scorecard and much more. Don’t forget to share it on social media sites like Facebook, Twitter, Google Plus, and others to let others also know. Stay tuned to The Reporter Times for latest cricket news and others updates. For daily updates, don’t forget to subscribe.